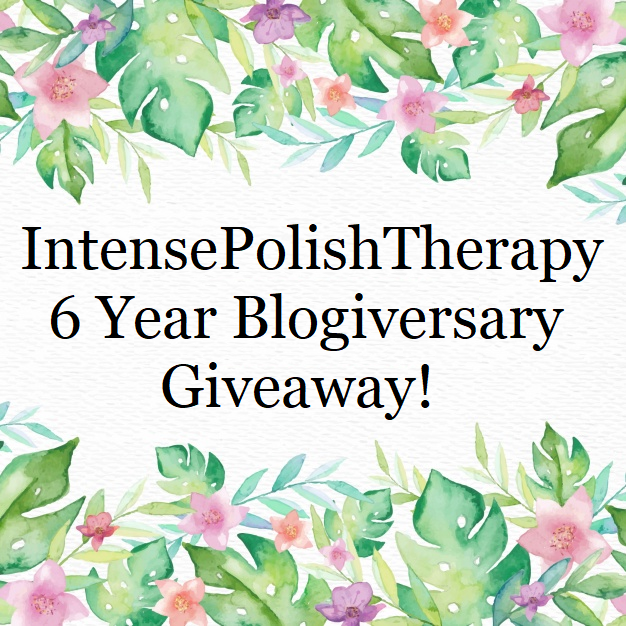 Intense Polish Therapy: 6 Year Blogiversary Giveaway! Hey loves! I am honestly so excited about this post, I can't even contain it. In July I have been posting on this blog for 6 years! That is absolutely incredible to me, because it honestly doesn't feel like it's been that long. So let's jump right into it! Shipping: This giveaway is open to Canada (excluding Quebec) & the US. If the winner is Canadian, I'll ship them from within Canada, & if the winner is from the US, I'll hop over the border & ship it from the US. This way you won't be hit with duties. To my readers, as well as the makers & brands I work with: I am beyond thankful for people who have been with me since the beginning as well as for the people who have been with me since last week. I truly appreciate the trust you have given me, as well as the consistent support. I appreciate all of the love, & encouragement you've always given me over the years, whether it's been through comments, messages, shares or views. Due to every single one of you, I have more opportunities than I ever imagined I could have. Wow - 6 years! Congratulations and thank you for the chance to win! Congratulations for 6 years, what a milestone! Thanks for such a generous giveaway! I'm keeping my fingers crossed that I win, but good luck to everyone! PS: My favorite color is green! My favorite color is blurple! What an amazing giveaway! Good luck to everyone! Wow, what a great contest. Congrats on the years. It's not easy and takes a lot of time to create a blog. Whew I feel like I just ran a marathon after all those follows! Thanks for the opportunity, this is huge. Happy Anniversary on your blog! Thanks for the great giveaway! OMGosh!!! I would love to win prize 1 but honestly they both are amazing!! and so are you for doing this for us!! Hey, you do not have any of the clickable links in the entry form. Congratulations on your 6th year Blogiversary! And Thank you for having such a generous giveaway. I wish you many more happy years of blogging! sad i missed the giveaway.